We've done it again. We've let the dishes build up and now we have a greasy, sticky pile that covers every kitchen surface. I have to admit I do this with alarming regularity. I'm not proud of it but at least I'm honest. 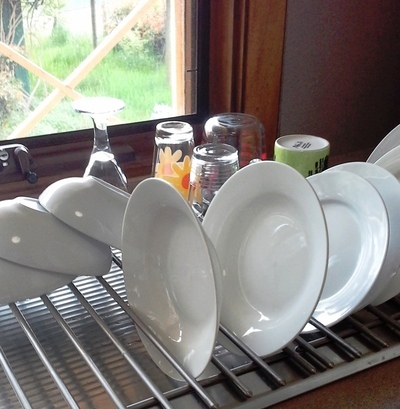 Because of my aversion to washing dishes I sometimes delay the task until I have no clean ones left and then I have no choice, so I've perfected the quickest and easiest way of dealing with them when they need to be done. Of course, the ideal solution would be to invest in a dishwasher but I'm also frugal and can’t justify the cost. -	Then I empty everything out of the sink and wipe it out with disinfectant. -	I group everything according to what will be washed first then wash in this order: Glasses, mugs, bowls & plates, plastic-ware, cutlery, pots & pans. -	I usually do two rounds, changing the water half-way through and drying the first lot while the second lot soaks. -	Warm up greasy cookware and wipe out with paper towel before washing. 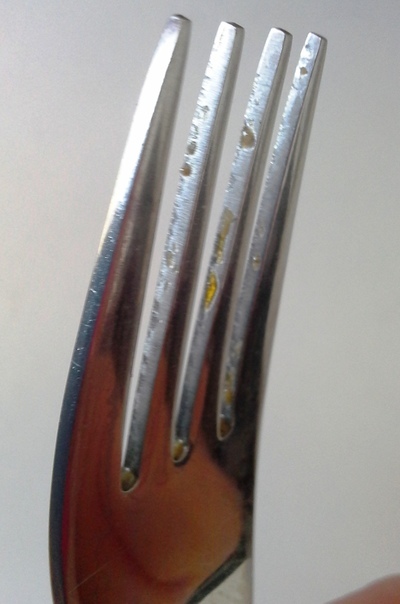 -	While your forks might look clean at a glance, if you look closely between the tines you will often see stubborn, stuck on gunk. Soak them and then use a brush to thoroughly scrub. 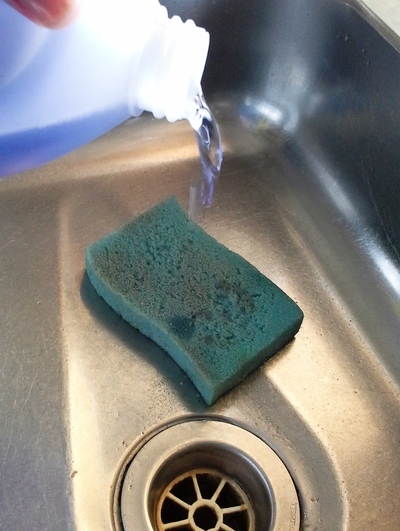 -	Use a clean tea towel every time then use it to do a final wipe-down of the sink. -	If you’re not completely bored yet and the water is still relatively clean, make the most of it by washing the dog bowls, a few ornaments or wiping over your appliances. 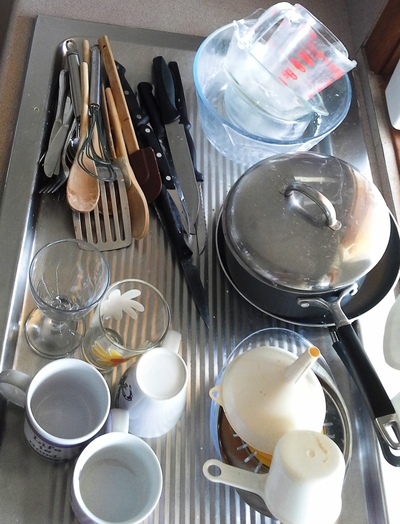 Of course, the best move is to not let the dishes build up in the first place but for someone like me who always procrastinates over unpleasant chores, the next best thing is to find the quickest and easiest fix. Have had the use of a dishwasher for decades'. 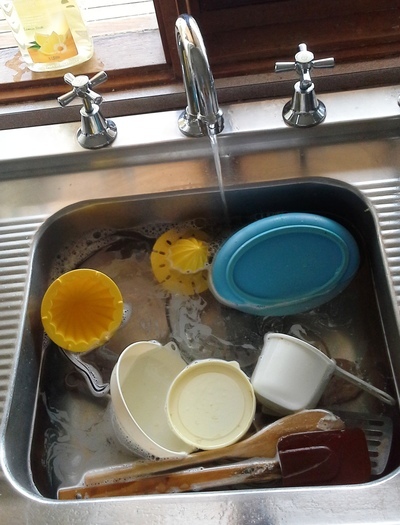 Having dirty dishes etc piled up in the sink is just anathema to me. Had open plan kitchen & dining area, so if guests' present, was not out of sight or contact with them, I would pack, run load, & husband would unpack. We'd continue doing this until end of night, with final load running as we retired for the night. That way, came out to sparkling clean kitchen, & sinks, the next morning. Makes a good start to the day! Thanks for this useful article. Although I have a dishwasher I find there are some things that need to be washed in the sink. They seem to pile up quite quickly.